Bangabandhu Sheikh Mujibur Rahman Maritime University BSMRMU is only one maritime public university in Bangladesh. 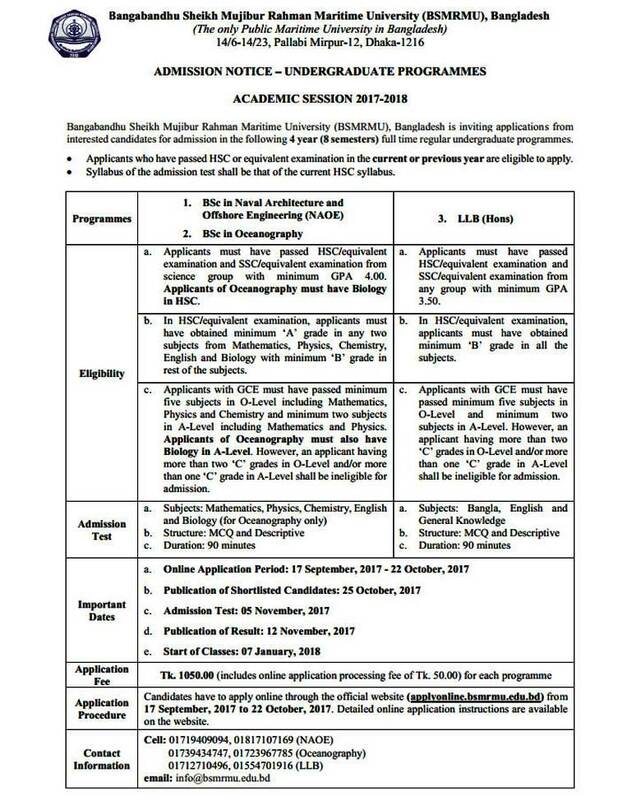 BSMRMU admission circular 2018-19 has recently been published. According their published circular here is the details of BSMRMU admission test 2018-2019. BSMRMU is accepting application for the 2018-2019 session of the following courses. The total duration of the academic session is four years which is divided into 8th semester. After applying BSMRMU will publish the elegible list of candidates to their official website. After publishing the eligible list, qualified students have to download the Admit card from their official website. Elegible students have to go through admission test to get admit in BSMRMU. The Admission test questions types will be MCQ (Multiple Choice Question) and descriptive. Total duration of the exam is 90 minutes. Thank you very much For mentioning the BSMRMU admission Test process. I found the information what I was looking for. Keep it Up. All the details written above are about the admission procedure of 2018-19. Whereas the picture provided shows 2017-18.it will be nice if you clarify this.thanks in advance.